You all know I’m a huge advocate for conscious consuming. I believe that you should be aware of everything you bring into your home and body, which includes what it’s made of, where it came from, etc. Decluttering your lifestyle of hazardous toxins is just as important as decluttering your physical belongings. Earlier in the year, I asked celebrity makeup artist, Lauren Andersen, how to create a minimalist makeup bag. I wanted to expand on that further and see how to transition to a clean beauty routine, so I asked long time makeup artist and Beautycounter consultant, Meryl Hathaway. Read her amazing tips below! Why is a clean beauty routine beneficial? So many reasons, honestly, but mainly to curb the serious health issues that have been rising due to toxic chemical exposure. We know how polluted the air we breathe can be, and how processed our foods are. But what about what we put on our faces and bodies? Studies show that by cutting out harmful and questionable ingredients applied or ingested, we can avoid all kinds of common illnesses. To show how dire this issue is, and why it’s so important to reap the benefits of a clean routine, get this- In the UK, they have banned 1,400 ingredients that have been proven to be harmful and have no place in our skincare or cosmetic products. The United States, to date, has banned 30… and hasn’t passed safer legislation since 1938! Meaning, that most products available, being heavily promoted, and making clean claims, still use ingredients that can make you and your family sick! Transparency is crucial when it comes to the skin care and beauty industry, and all it takes it a little bit of effort and an open mind to leave your “favorites” behind. What products do you recommend for someone transitioning into all-natural beauty products? Beautycounter skincare and cosmetics are the only products I can confidently recommend, as they are the only company with full transparency and vocal goals to educate consumers as 50% of their focus. Their motto is “to get safer products into the hands of everyone”, and as a B corp, they are doing just that by advocating in Washington to encourage progress and change. They have skincare products for all types, including a few of my absolute favorite products- the Charcoal Cleansing Bar, as well as the Charcoal face mask, leaving you with the freshest, cleanest skin you’ve felt in a long time, possibly ever. The Brightening Facial oil has a light, fresh citrus scent I LOVE and adds the kind of moisture that leaves you glowing like J.Lo, day and night. I’m a big fan of the Adaptive Moisture Lotion, which adjusts with your skin throughout the day, and for anyone I’d recommend the – it sounds scary, but it’s a fantastic detoxifier. I never leave home without my Countersun Mineral Sunscreen Stick, which gives 30 SPF and a soft, moisturizing feel. I am so impressed with the pigments of their cosmetics too, my favorites being the Tint Skin Hydrating Foundation, the Color Intense Lipsticks that really last and I use the Classic eyeshadow palette on all of my clients! It’s hard to choose favorites, honestly, I could go on and on. What are great multi-purpose products for a minimal routine? For both morning and at night, you want to follow 4 steps- cleanse, treat, moisturize and protect, but you don’t need a million things to do it. My favorite Beautycounter products that cover more than one daily step, include the Charcoal Cleansing Bar, which can be used on the face and body in the shower for all skin types, day and night, the Cleansing Balm (softly cleanses with the included cloth AND can be used as an amazing moisture mask at night for our dry friends). The Countersun Mineral Sunscreen comes in a spray that makes it super easy to protect your skin and body daily with a quick spritz, and the One-Step Makeup Remover Wipes work beautifully at the end of the day without drying. For oily skin, sub out the Cleansing Balm and use CounterControl Matte Effect Gel Cream to control oil and moisturize. To treat, the Moisturizing Serum is fantastic for super dry skin types to apply day or night, and for those of us who travel a lot, any of these products would be ideal. Any ADDITIONAL tips you would like to share? 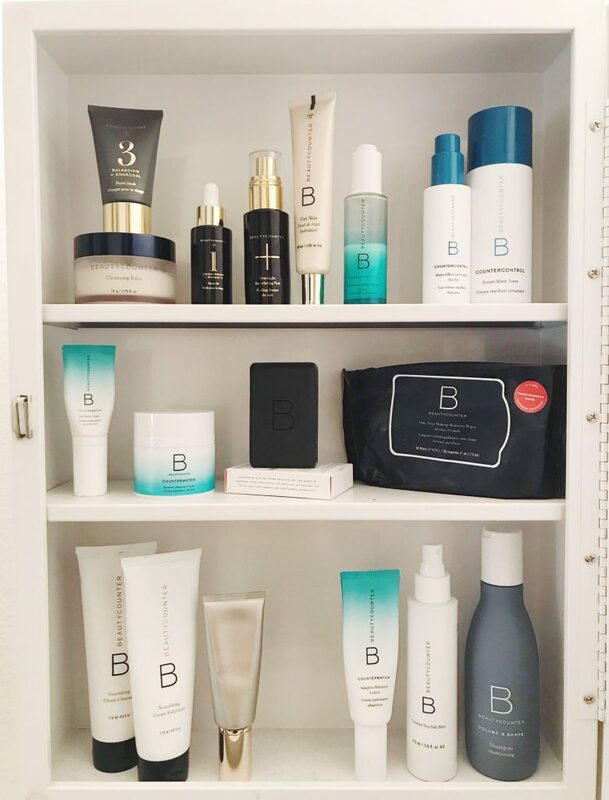 I have worked closely with a wide variety of skin types for 15 years, and for the first time I am using ONLY one brand, Beautycounter, for skincare and beauty products on myself and my clients. Knowing chemicals aren’t regulated in any way really scared me! But there is a solution, we have options, it’s worth the transition, and it’s affordable! The price points are very very competitive, making it easier to go for it. I think it’s important to do swaps with both your skincare AND your cosmetics, otherwise you’re going to continue harming your skin one way or the other, like putting a big tub of ranch dressing onto a light salad… it defeats the purpose! Note that for the first couple weeks of transitioning, your skin will need to expunge what’s been previously absorbed, and may break out more for a week or two. Don’t get frustrated, it’ll clean out with continued usage and I promise that you’ll feel and see a significant change. My skin looks better than it did for years, it’s cleaner, more hydrated and brighter than before I switched, and my clients agree. Taking chemicals out will not only prove that you don’t need them to get what you need, but emboldens individuals and families alike that their daily routine is helping, not harming them! That peace of mind is important, we all have enough to worry about, and when you make the swap, that’s one less concern. Head over to Beautycounter to check out their products! If you have any questions for Meryl, feel free to follow or DM her on Instagram @merylhathaway! Please note: this post is not sponsored by Beautycounter or any other affiliate. Clutter Healing® does not make any profit for purchased items through the provided links.